The four-day Test comprised of two matches kick-start in Wayanad on February 7. 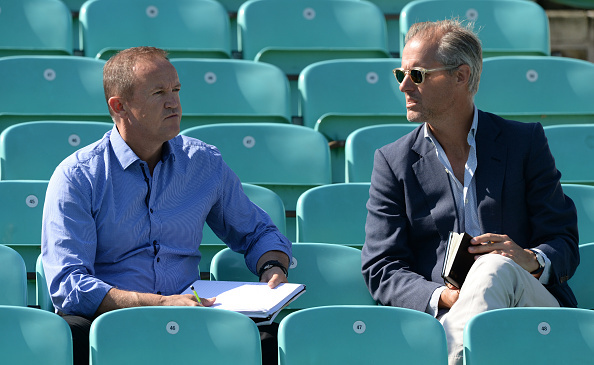 T20 has taught young cricketers to "hit the ball" cleanly and its a skill they can transfer from there to the red-ball arena, said Andy Flower. England's ever attacking approach has come under widespread scrutiny ever since senior team head coach, Trevor Bayliss, blamed the "ODI mindset" behind his side's poor batting performances in the ongoing Test series against West Indies. While three lions have Internationally lost their first two Tests in the Caribbean, their second strings in India haven't done well either. England Lions start of their two-match unofficial Tests series on February 7 having gone down 4-1 in the 50-overs battle. But their mentor isn't too worried about things yet. "I think one positive aspect that comes from playing franchise cricket is that the young players are learning to pick the bat up and hit the ball," Flower was quoted saying by ESPNcricinfo in Wayanad, "And the bowlers are learning different skills. And those are transferrable skills in the all three formats." "There's soon to be the fourth format(The Hundred) in England. I think it's actually a positive thing. It's lovely seeing batsmen pick up the bat and hit the ball to the boundary. Certainly, for youngsters, it's a fun way to play. I think it can help one develop in all formats of the game." Lions' skipper Sam Billings, who scored a ton in the one-day series, is actually taking inspiration from Flower's words. Right-hand batsman went on to say that he'll continue playing the IPL despite his red-ball potential questioned by many in the county championship. "In the last few years of my career I've played white-ball cricket, just somehow I've played a lot of it. I've been a part of the ODI team for the last three years or so, but obviously haven't found myself in the team consistently anyway," Billings said. "And obviously the IPL cuts into the four-day championship at home. I've made a decision to play in the IPL. It is the opportunity I can turn down, but I stand by that decision to play again this year." Ravi Shastri backs Hardik Pandya says "who doesn't make mistakes?"